Lonnie Krahn and Kevin Gillies were honored at the Properties Sports Association Volunteer Appreciation Night on May 6th. 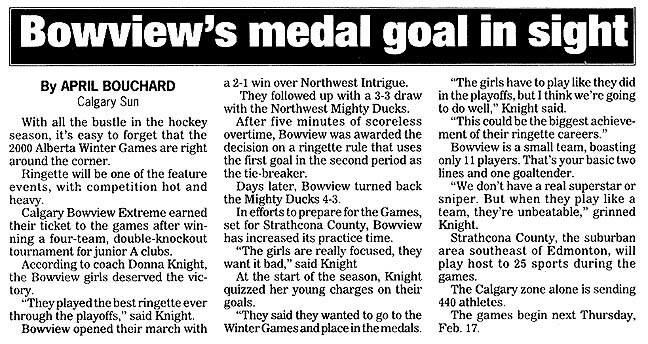 Calgary PACE Tween AA went to the Western Canadian Ringette Championships in Burnaby where they won GOLD. Calgary VIBE Junior AA and Calgary Vision Belle AA attended the Canadian Ringette Championships in Prince George and both won GOLD. The 14th annual Esso Golden Ring was held Jan. 28-30, 2000 and hosted Bunny through Intermediate divisions. 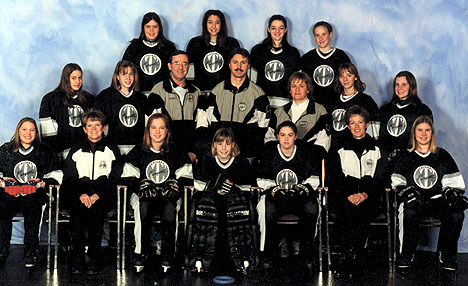 There were 162 teams in 16 different divisions. The tournament was sponsored for the 14th year by Imperial Oil Limited. Teams from Alberta, British Columbia, Saskatchewan, Ontario and Quebec took part in the three-day competition. 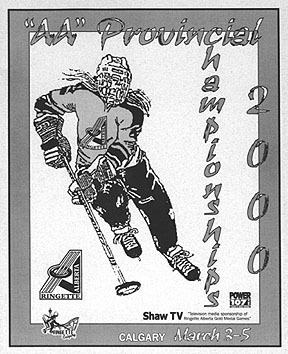 In addition to the 71 Calgary teams there were 75 teams from other parts of Alberta, and 16 out of province teams - 10 from British Columbia, 2 from Saskatchewan, 3 from Ontario, and 1 from Quebec. A total of 167 applications were received from teams with hopes of securing a spot in the tournament. Regretfully, we were unable to accommodate 5 of those teams. For the first time Esso Golden Ring custom game sheets were used in the tournament. Competition was exceptional, with overtime in 11 of 36 quarter-finals, 8 of 26 semi-finals and 5 of 15 finals. 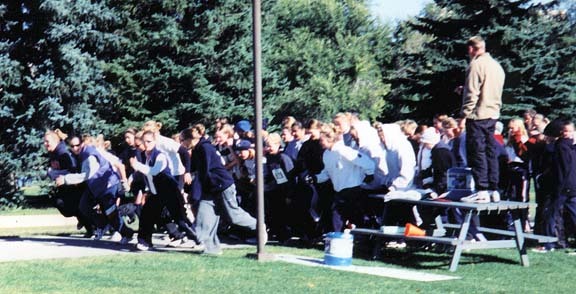 2000 saw a continuation of the Bunnie division in the tournament. Fourteen teams of excited Bunnies each played three exhibition games. All Bunnies are considered winners, and each receive a participation medallion following their final game in the tournament. Play took place at 17 arenas, a total of 22 ice surfaces with the first game commencing at 7:00 am on Friday, January 28, and the last game ending at 7:00 pm on Sunday, January 30. 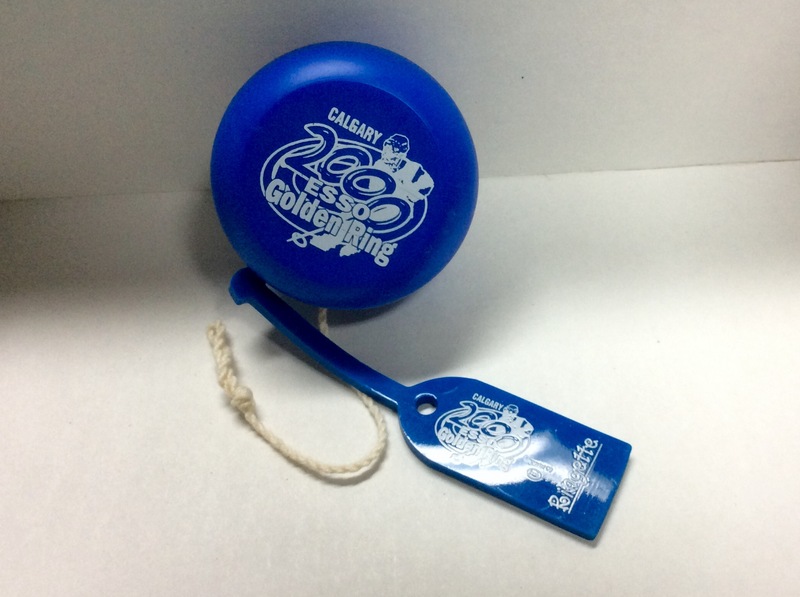 The "take home" souvenirs which the 2000 Esso Golden Ring committee provided to all players were "tag-its" ID tags, a yo-yo, and a sheet of temporary tattoos, imprinted with the Esso Golden Ring logo. 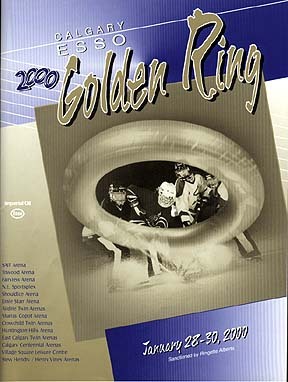 In addition, all players were provided with a full color 2000 souvenir poster. Bob Campbell, assisted by Erik Laerz was responsible for the task of scheduling officials for the 332 tournament games. 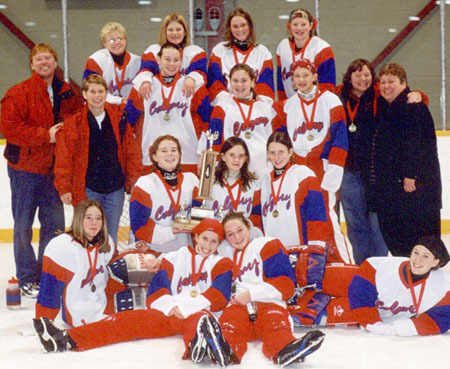 Robyn Schweitzer, president of the CRRA, was also heavily involved in organizing and inviting officials to the tournament. Once again a referee social and information session was held. The hospitality night was held Friday, January 28th at Marlborough Community Hall, and for the first time it was "carnival style". Activities included kareoke, mini-golf, carnival games, cotton candy, popcorn and lots of fun. 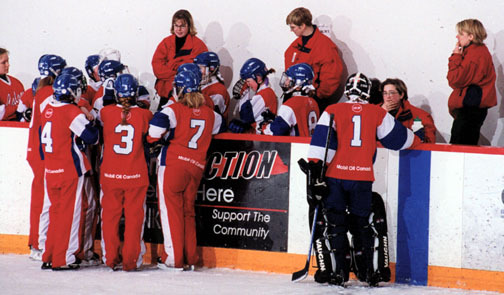 The City of Calgary Parks and Recreation supplied and ran the games, and each team was given a complimentary recording of their karaoke performances. 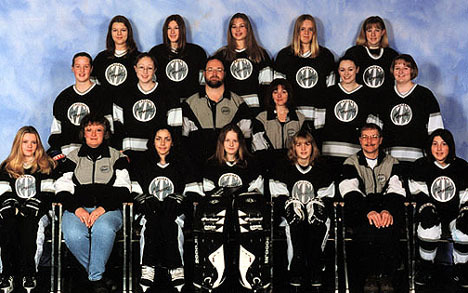 The Ringette Calgary Home Page provided an application form, hospitality night information, a list of successful applicants, and the schedules. 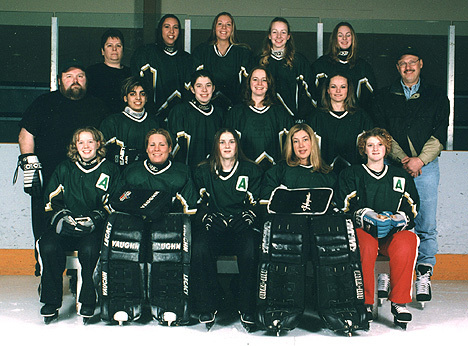 This greatly reduced the number of inquiries to the Ringette Calgary office, and expeeded the process of providing information to teams. 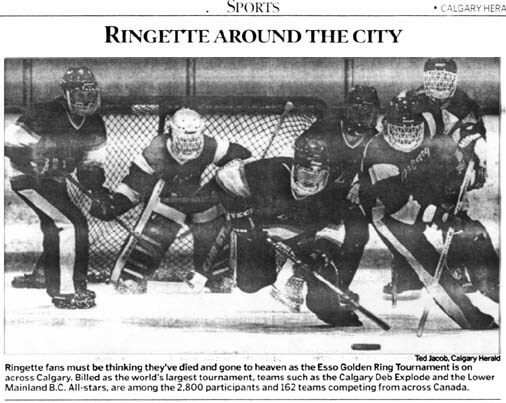 In the world of minor sports, ringette isn’t even worthy of a mention in most city newspapers. 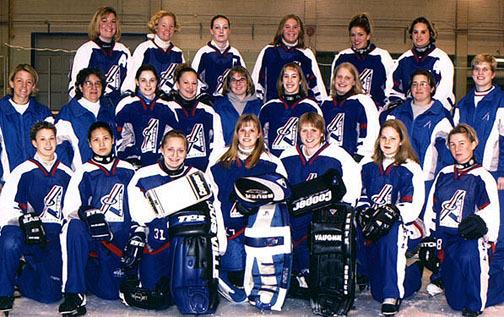 The general sentiment seems to be that the real ice sport is hockey, and if girls were serious enough or talented enough, they would join hockey teams. 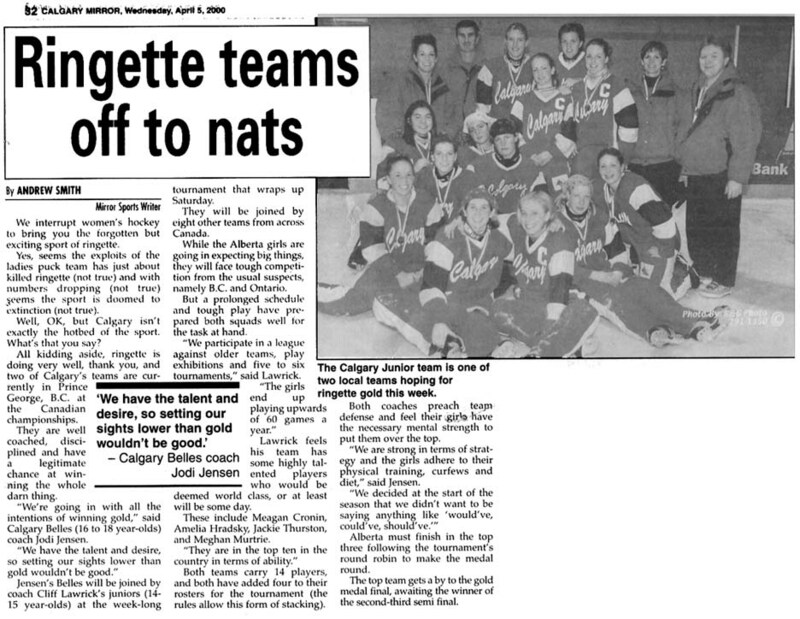 This daunts the spunky ringette players not a bit as they skate, pass and score with a finesse and drive that matches anything the boys can do. Every January Calgary hosts the Esso Golden Ring, a tournament held in much esteem and the subject of great enthusiasm and excitement. Watching one of the playoff games last year, I found myself deeply touched by the drama I saw unfolding. My daughter’s team was strong and had already secured a spot in the gold medal competition the next day. The team was tired, and everyone knew that the game they played that day would not have an impact on their chance to win the tournament. The opponents were definitely the underdogs; having won only one game and tied another all season, they were accustomed to defeat. Their goalie was new at her position and, although she was trying her best, it showed. Toward the end of the second period, not one fan was still sitting in the seats; the emotion was too intense. My daughter’s team woke up just in time to realize they might indeed lose the game and, rallying quickly, scored two goals to tie and then win. I felt devastated that the team that had worked so hard had lost, but looking over the ice, I saw they didn’t feel as though they were the losers at all. 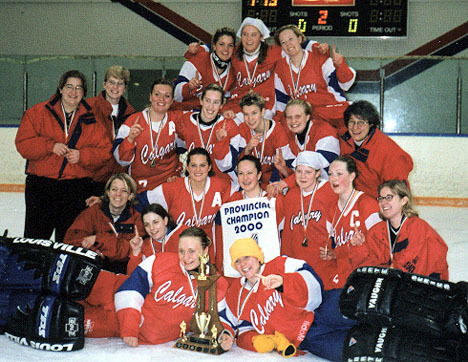 The two women coaches jumped up and down hugging each other while the players piled on top of one another as though they had won the Stanley Cup. Three players got behind the little goalie and pushed her around the ice in honour of their near victory as she waved her goalie glove queenlike to her adoring audience. The parents screamed their support and excitement as one mom yelled down, “I’m taking everyone to the Dairy Queen.” Our team smiled bemusedly as the other girls enthusiastically shook their hands with comments of “You’re our favourite team” and “We’ll be cheering for you in the Golden Ring tomorrow.” My throat felt thick with emotion as I watched how much it meant for them to almost beat a good team. When I think of that game, I wish there could have been a few NHL players in the audience so they could remember what it used to be about: not personal income but personal best; that the meaning of sportsmanship is teamwork and honouring your teammates for their effort and commitment, and respecting your opponents for theirs; and to stand behind your goalie not because she won the game but because, against insurmountable odds, she never gave up and tried her best until the end. You can have your upholstered seats, cold beer and designer coffee at the NHL games. I would rather spend my time on cold benches with coffee from a vending machine watching a game in which everyone goes home feeling like a winner.